To describe U2 3D as a spectacular 3D presentation of spectacular performances by the band on their Vertigo tour is to sell it short. U2 3D is a beautiful statement about civilization and the possibility that different cultures, religions, and technologies can coexist — if we want them to. 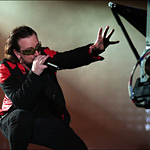 Edited down from more than 100 hours of footage shot during the 2006 Latin America and Asia-Pacific legs of the band’s world tour in support of the album How to Dismantle an Atomic Bomb, U2 3D offers viewers the best seats in the house, including on — and above — the stage. This isn’t old-school, gimmicky 3D. This is the first live action movie shot in digital 3D and it is something to behold. U2 doesn’t know how to do things half-assed and their commitment to pushing boundaries and piercing envelopes continues with this production. Going beyond presenting the concert footage in 3D, there is a real artistry on view in how all the elements are brought together. One of the many fantastic highlights is Sometimes You Can’t Make It On Your Own, a song about Bono’s father, who died in 2001 only a couple days before the band was to take the stage at Slane Castle. The pure emotion of the song, the beauty of the words, make it a show standout. The 3D presentation magically, masterfully amps up the power as Bono sings his heart out on the catwalk. The image of Bono on the giant screen, stage right, is seamlessly integrated with The Edge onstage, as if the digital Bono and The Edge were performing a duet, and, finally, Bono embraces Willy Williams’ animated man from the giant screen, stage left. It’s only January, but it’s hard to imagine a more thrilling cinematic experience this year. Whether it’s the sheer energy of the band, the joy on view in the stadiums holding tens of thousands of Bonoholics, or nifty visual tricks, each song has something new to savor. “Ooohs” and “aaahs” abound. During Love & Peace or Else, Bono crouches on the stage and 3D-enhanced animation follows Bono’s hand gestures. And the audience gets extremely up close to Bono as he reaches his hand out, encouraging a 3D Bono-bonding moment during Sunday Bloody Sunday. Even the end credits keep the creative energy flowing; while the band plays Yahweh, Williams’ stage visuals come to brilliantly animated, three-dimensional life. The first word heard in U2 3D is “everyone.” Anyone who witnessed the Vertigo tour firsthand will know that voiceover was a part of the pre-show hype, an indication the biggest band in the land was about to take the stage. It’s the perfect first word for a band, an album, and a tour whose primary message is all about coexistence. Woven into a set list that is friendly to both fans and the uninitiated is a refreshing sense of hope and empowerment. It’s a feeling familiar to those fortunate enough to see the band live, but seen in the context of the massive throngs of humanity fleshing out the stadiums in U2 3D, there’s a tangible, global element that elevates the feeling to a wholly new, sweet level. As Bono succinctly puts it as lead in to One, Argentina and Ireland have a lot in common. They both want to put their troubled history behind them and work toward a better future. Left and right together. Uno. Also embedded into the music are calls for tolerance among the sons of Abraham, the pursuit of Martin Luther King, Jr.’s dream, and the Universal Declaration of Human Rights. The magic of the movie makes the screen disappear and the temptation is there to reach out to Bono and to the emphatic fans clamoring against the rails. The magic of music makes the experience more precious than any futbol match. All that said, though, no amount of technology will ever be able to fully capture the pure exhilaration and joy experienced in the stadiums and arenas around the world when U2 are on stage and you, too, are in the crowd.